Saint Andrew's Cathedral, built in 1859, is Singapore's largest Anglican cathedral. 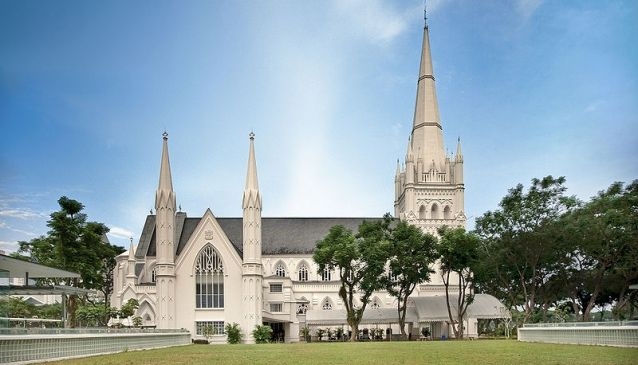 Located in the Civic District, the St. Andrew's Cathedral of the Anglican Diocese of Singapore is mother church to over 26 parishes and 55 congregations. The Cathedral is owned by the Synod of the Diocese of Singapore, which is a center for the Anglican Mission of Singapore. In 1856, the St. Andrew's Mission launched the first-ever Anglican outreach in Singapore. Later in 1942, just short of the fall of Singapore to the Japanese, the church served as an emergency hospital. Today it also serves for weddings, funerals, education and community services like child development. The Early Gothic building is a beautiful sight right in the heart of Singapore and we recommend to join of the complimentary guided tours organized by the church. The times are listed on their website.